Dr Samuel Alexander is a lecturer and researcher at the University of Melbourne, Australia, teaching a course called ‘Consumerism and the Growth Economy: Critical Interdisciplinary Perspectives’ as part of the Master of Environment. He is also a Research Fellow with the Melbourne Sustainable Society Institute and co-director of the Simplicity Institute. 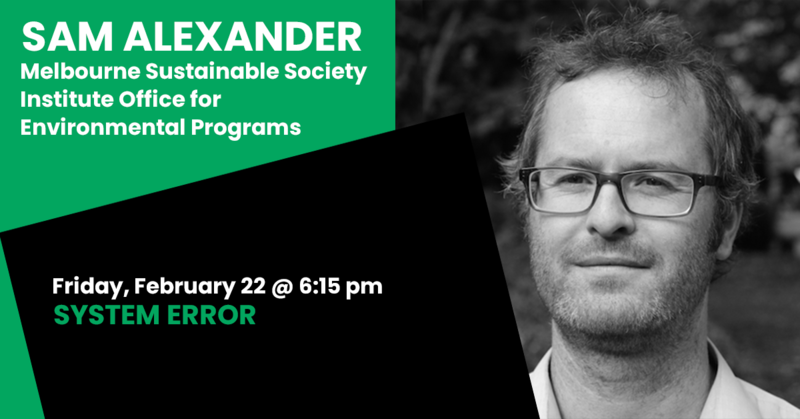 Alexander’s interdisciplinary research focuses on degrowth, voluntary simplicity, ‘grassroots’ theories of transition, and the relationship between culture and political economy. He has published thirteen books on these subjects, most recently ‘Degrowth in the Suburbs: A Radical Urban Imaginary’, co-authored with Professor Brendan Gleeson.